The long-awaited side-scrolling adventure is finally almost here, featuring cross-buy support for PS4 and PS Vita. If you were deciding whether to get a PS4 back in 2014, you may have walked up to a demo kiosk at your local Best Buy or Target and tried out a game called Chasm. Or maybe you were already familiar with it from the time it first hit the public eye the year before when it blew away its funding goal on Kickstarter. And then you may have wondered whatever became of that game that reminded you of your favorite games from back in the day. Well, I’m happy to report that the little team that could is now putting the final touches on this passion project that has consumed five people for nearly six years. We expect to be submitting the final game to Sony in a couple months and launching this summer. We’ve created a teaser trailer to whet your appetite which you can watch above. Welcome to Chasm, an action adventure game in which you play a new recruit undertaking your first mission for the Guildean Kingdom. Thrilled to prove your worth as a knight, you track strange rumors that a mine vital to the war effort has been shut down. But what you discover in the mining town is worse than you imagined: The townspeople have begun to disappear, kidnapped by supernatural creatures emerging from the depths. Honor-bound to solve the mystery and restore peace to the Kingdom, you embark upon an epic adventure, with deadly battles against cunning monsters, exploration of ancient catacombs and castles, and powerful new equipment hidden at every turn. Though the overall story is the same for all players, your hero’s journey will be unique: each of the rooms has been hand-designed, and behind the scenes Chasm stitches these rooms together into a one-of-a-kind world map that will be your own. This map isn’t a spoiler since yours will be different! We were grateful and humbled by the outpouring of enthusiasm for Chasm when we first announced it five years ago. So many people tried the demo we put out with the Kickstarter and thought that it already seemed like a finished game. In fact, we’re still using some of the assets from back then, including the main character, some of the NPCs, and a few enemies. So what have we been up to all this time? We certainly fell prey to Hofstadter’s Law, which states that things always take longer than you expect, even when you take into account Hofstadter’s Law. A lot of our favorite games took over five years to make, including Axiom Verge, Owlboy, and Spelunky. On one hand, we may have started talking about Chasm too early, so people who were excited by it felt that development was taking forever. 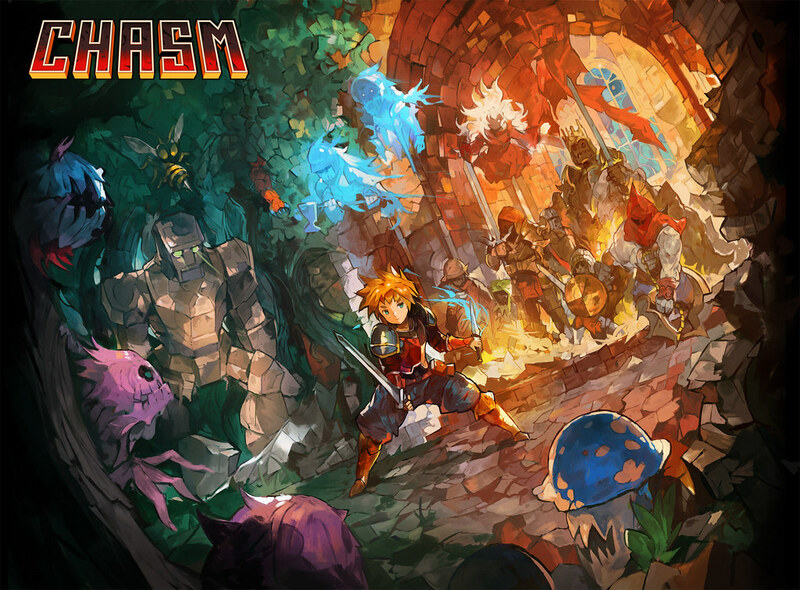 On the other, had we not talked about it when we did, Chasm would never have gotten made. The game exists thanks to the financial and emotional support of those early fans, and we are eternally grateful. One of the most difficult things to get right was the underlying code base. When we made that early demo, it was stitched together with bubblegum and duct tape. We wanted to make sure that everyone playing Chasm would have their own world map that was unique to them, and we also wanted to make sure that every possible world map had the right pacing, variety of gameplay, and challenge. I think we succeeded. Many of our playtesters didn’t even realize that their world was a one-of-a-kind until they started a second playthrough. Another challenge was the sheer volume of content. We had an overall story arch and world structure in mind when we set out to develop the game, and that required a lot of content. 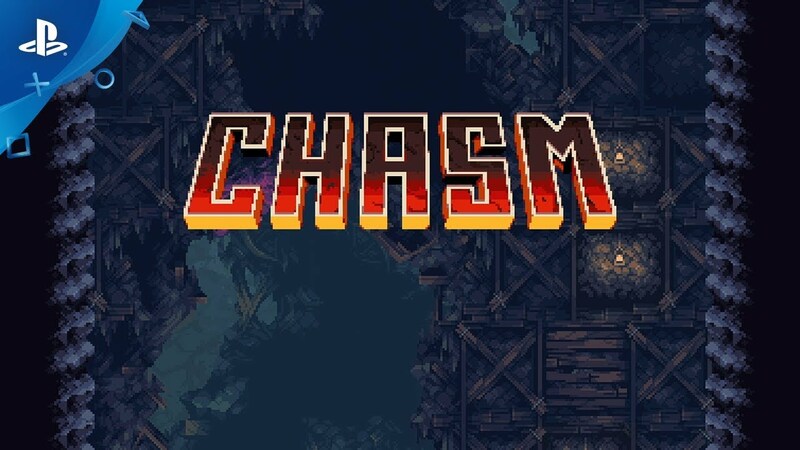 Whereas the earliest demo had a few enemies and room types in the first area of the game, Chasm now has six fully realized areas, with tons of enemies, bosses, puzzles, and platforming challenges. Detailed backgrounds, sound effects for every enemy, puzzles, and side quests are all critical to the creation of an immersive make-believe world. We don’t want to spoil too much with our official release finally just around the corner. But we will give you one final bit of new information. Back when Axiom Verge launched on PS Vita, lots of people asked Dan Adelman (who handles the business side of both games) if Chasm would launch there too. Dan replied that it would depend on how Axiom Verge did. Well, I’m excited to confirm that Axiom Verge did well enough on PS Vita that we decided to make Chasm cross-buy. And best of all, this added no time to our schedule, since the guy who did the Axiom Verge port was able to get Chasm’s code base up and running while we were still working on the game. We’ll have more details about the specific release date soon, but for now, keep your summer open! I really wish there was a way to mark interesting games to more easily keep up with information and release dates. That is a good point. We can wishlist games that are on the PS Store for pre-order or after they are released, but while they still in development, it would be nice to be able to mark interest in game on the PS Blog so that we can get notifications of new information about the game. There are many ways. Most developers have an active Twitter account that might give behind the scenes info and will definitely become more active when launch is coming. Even if you don’t use Twitter that often, it’s a great place to check in occasionally for updates. You can also check to see if there is an email list for the game. It took me less than 30 sec to find out that there is one for this game. Sign up for it and get info on the games you like, just do a bit of work for yourself and don’t rely on the companies finding you when it’s time. Thank you! As Nuurgle pointed out, you can join our newsletter at chasmgame.com. We send out updates about once a month and will be sure to let you know once we have a final release date – and of course when we actually launch! Great feedback, thanks! It would require some substantial dev work on the Blog’s backend, but this is actually an idea we’ve tossed around in the past. It’s definitely something we’re interested in! Now please let us pre-order staring tomarrow! Thanks for your interest and support! I’m not sure if we’re able to set up a pre-order. I’ll need to check with Sony on that once we get closer to launch. We’ll be sure to write something on the PS Blog on our launch day, so if you check this blog every day, it’ll show up again there. Also, as Nuurgle said, you can sign up for our newsletter at chasmgame.com. We send development status updates about once a month. I’m so glad to see this one is finally coming out. I’m one of those people that did play it on a demo station and I loved it. Thank you so much for putting it on Vita, as part of that small but passionate community I can tell you we very much appreciate it. I’d love to see this come out physically too via LRG, this looks like one of those games I’d love to have in a more permanent manner like that. We’re definitely Vita fans too! We’re also interested in doing a physical release. Dan Adelman handles the business stuff for both Chasm and Axiom Verge, and he was saying that he’d like to do an actual retail release of Chasm someday since the retail release of Axiom Verge did so well. We’ll have to see what makes the most financial sense after we launch, but we definitely want to do something for collectors and people who just prefer physical media. It’s a big undertaking, though, so we don’t want to take that on until after the game is out. Holy smokes, just from the video gameplay alone, this looks like a DAY 1 PURCHASE. This will go quite nice on my Vita. Thanks for the Vita love. Just looking forward to a price announcement and I’m all in. Day one for me, I’m in love with the genre and it seems so absent these days… I wish I could pre-order it on the Playstation Store, I don’t wanna forget about it! Thank you! As was mentioned in a separate comment, you can join our newsletter at chasmgame.com. We send updates about once a month, and we’ll be sure to let you know when we confirm our release date and of course when we actually launch! Chasm has been in my radar for a while. It’s just the type of game that I like to play on the PS Vita, so it’s awesome that we get a port and that it’s also cross-buy. Absolutely. It’s great because you can play in relatively small bursts – just get to the next save room – or for hours. Perfect for a handheld. We knew we wanted to do something like that, and we were really lucky that Tom Spilman from Sickhead Games was available and willing to take this project on! Sony has also been very supportive of us getting a Vita version out there. This is very exciting news and you can expect a day one purchase from me. Thank you for bringing it to the Vita and congratulations on making it to the finish line. One question, will this have a platinum trophy? Thank you! Yes, it will have a platinum trophy. Thank you! Can’t wait to hear what you think of it! Hi James! It’s awesome to see how far this project has come since I played the demo on IndieDB well before the Kickstarter. It’s awesome to think that an indie developer I talked with in the IndieDB comments is now being posted about on the PlayStation Blog! Wish you luck with the remainder of the project and I can’t wait to play the full release! Thanks so much! The journey to bring Chasm to market has been a long one for sure! IndieDB was incredibly helpful for getting our foot in the door and getting some initial feedback on the concept. Is there any possibility of this game also being released on other platforms such as Switch or on Gog? I know its being released on Steam for pc but I don’t support steam and I’m sure others would also appreciate it being released elsewhere as well. Since this is the PS Blog, we should probably stay focused on the PS4 and Vita versions here. :) You can hit us up on Twitter to discuss any other potential platforms! I’m so pumped for this game. I was really upset that I missed my chance to support on kickstarter, but I’ve been following the development updates the last few months. This is definitely a day one purchase. Thank you so freaking much for the Vita support I can’t wait to play this on the go. Awesome work can’t wait to play it. Thanks so much for the ongoing support! We’ve been incredibly fortunate to have a community of supportive – and patient – fans. It definitely increases the pressure a bit, since we feel a responsibility to justify that trust you put in us. Day 1 buy and then I’ll buy it again when it gets a physical release. Stopped by your booth at PSX last year, you guys easily had one of the best looking cards they were handing out. Looking forward to playing the game later this year! Do you have any soundtrack samples of Chasm on youtube? I love playing Metroidvania type games when the background music is engaging (e.g. Castlevania Symphony of the Night). Either way this is a Day 1 purchase. Reminds me of Ys 3 Wandered from Ys. Definitely getting it! 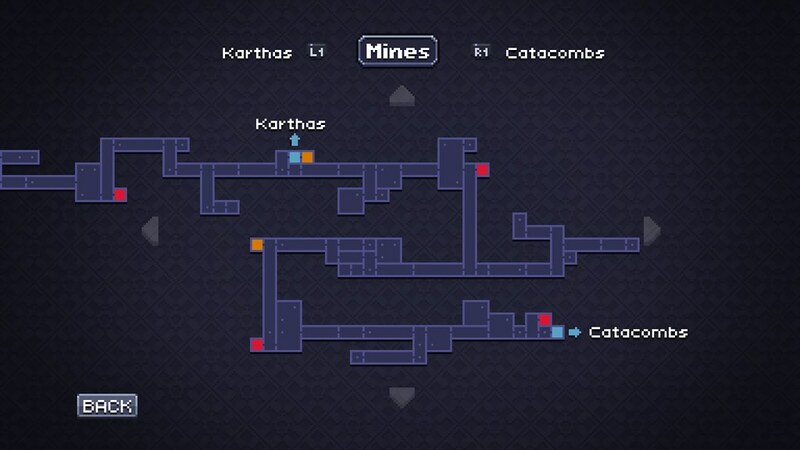 Wow, that map looks like something out of Metroid. To be honest, this is the first I’m hearing of the game, but it definitely looks like fun. I believe you said that this is for PS4 as well? If so, then this could very well be the first purchase I’ll make on a PS4. The boss patterns look classic, the map intrigues me, and I could do with a high-quality platformer. I can’t wait till it’s released, I look forward to what I’m sure will be an amazing game. if all turn out grate this game MIGHT be outstanding just to play it or just to have a well done pixel game. Wow this looks awesome! Right up my alley; definitely going to play this in the summer.